Without cable, I needed a place to watch the “Bar Rescue” episode Sunday about The Palace in Upland. So I chose San Biagio’s N.Y. Pizza, which is directly across Seventh Street from the bar. In fact, the TV crew had used an empty storefront next to Biagio’s as their office during the taping back in March. Watching the show there was a slightly unreal experience. As seen in the photo above, you could watch the episode on one wall-mounted TV (that’s some of the Palace staff on the screen) and then look out the window to see the Palace itself, the orange-tan building in the background. Pizzeria owner Biagio Pavia watched much of the episode with me. It was late afternoon, before the dinner crowd. The enthusiastic Pavia tried to encourage a customer near the TV to watch; he claimed not to be interested, although he did chime in at times. Another couple professed polite interest. People are so jaded in Southern California. 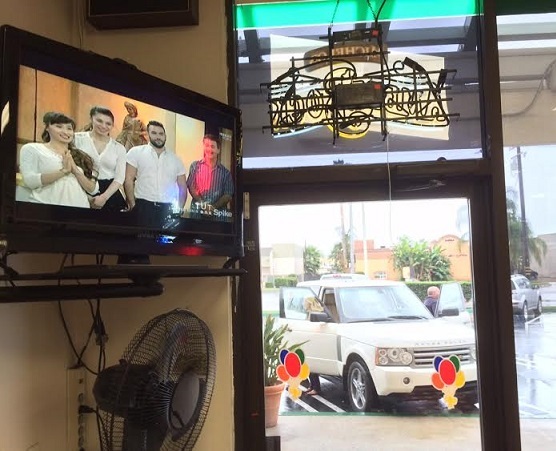 A neighboring business is on national television right at that instant and they’re like, shrug. Pavia, though, was curious, keeping up a running commentary of questions and comments, many of the “What is that?” variety, while I was trying to listen and take notes. I had to explain at times that what was on the screen was a commercial. Anyway, the Palace was run by two brothers-in-law who didn’t get along, surveillance of the kitchen showed cross-contamination, the decor and vibe didn’t seem very Middle Eastern and the bartenders didn’t know how to pour a drink, or even grip a bottle properly. The bar needed so much work, the “stress test” took place off-site, at Pomona’s Stein Haus, allowing the TV crew a full 36 hours to remake the Palace. The stress test was a disaster, with pita bread coming out of the kitchen hard as a rock and the bartenders completely overwhelmed. One was fired on the spot. Host Jon Taffer cut it short. “You are the worst team we’ve ever seen!” Taffer shouted in frustration. Of course, reality TV hypes up the drama, as well as the results, and by the end, the brothers are friends again, the staff knows its business, the decor is lovely and business is up. Pavia exclaimed, “They change everything, look!” as the new decor was unveiled. I think that the last time that I was in The Palace was several decades ago, back when it was a disco. I assume it’s changed. But you won. You got San Biagio’s Pizza out of the deal. I did, plus an unusual experience. About the Palace and Bar Rescue, it wouldn’t surprise me if the truth was somewhere in the middle regarding both the troubles and the transformation. A friend and I tried to get Mediterranean food there a few months back. No one seemed to know what to do with us. We couldn’t tell if it was actually open for business. Cavernous place. We found hummus elsewhere. We love San Biagio’s pizza, by the way. Biagio is lovable, too. He is, isn’t he? Your Palace experience would seem to mirror some of the older comments on Yelp.